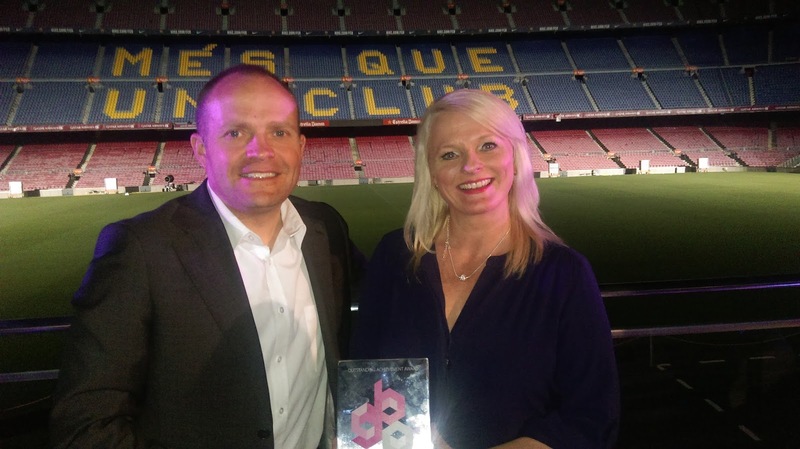 Denise Barrett-Baxendale has paid tribute to “the huge amount of hard work, enterprise and courage shown every day by the Club, our fans, the Community scheme and all of our volunteers and participants” after Everton in the Community won the Outstanding Achievement Award at TheStadiumBusiness Awards 2015 in Barcelona. Everton’s Deputy Chief Executive and Chief Executive of Everton in the Community accepted the prestigious award on Wednesday evening in Barcelona’s Camp Nou Stadium, the culmination of TheStadiumBusiness Summit which brings together senior industry figures from stadium sports businesses around the world. Now in their sixth year, TheStadiumBusiness Awards are the only awards to recognise a whole spectrum of achievements from across the global stadium industry. Everton’s multiple award-winning charity was recognised by an international judging panel for outstanding delivery of dedicated programmes which focus on education, health and wellbeing, exercise, disability, social inclusion and community cohesion and which positively impact people’s lives daily. As well as representing Everton at TheStadiumBusiness Awards, Denise and Everton’s Director of Marketing and Communications, Richard Kenyon, delivered a keynote presentation at the Fan Experience Forum, showcasing the Club’s work in engaging with supporters all year round. Denise commented: “I feel really privileged to accept this award in such prestigious company and such an amazing venue. This award reflects the huge amount of hard work, enterprise and courage shown every day by the Club, our fans, the Community scheme and all of our volunteers and participants. “While it is me who was called up on stage to accept this accolade, it really is recognition for the many people who, both now and in the past, have shown determination and ambition to help drive us forward and make these positive impacts in people’s lives. Hundreds of nominations were whittled down to create the shortlist, some of which were voted for by the industry and some judged by an independent panel of industry figures, including: Andrew Daniels, CEO, Adelaide Oval; Al Guido, COO, San Francisco 49ers; Marie Lindqvist, GM, Stockholm Globe Arenas; Roger Maslin, MD, Wembley Stadium; Peter McKenna, Stadium & Commercial Director, Croke Park; Julian Jenkins, CEO, Servette FC; Richard Peddie, Former CEO, Maple Leaf Sports & Entertainment; Ian Nuttall, founder of TheStadiumBusiness/Xperiology. Ian Nuttall, founder of TheStadium Business Awards, added: “Congratulations to everyone who reached the podium. Winners included our industry’s leaders, achievers and stand-out venues, who should all be very proud of their achievements.